Distance from the Liberty Stadium: 150 miles ~ 2 hours 30 minutes. The ground is really easy to get to, no pubs near and a nightmare to get away from. Away fans are behind the goal with excellent facilities, plenty of leg room and the views of the pitch are superb. The regular football food of burgers and pies are sold. It’s an industrial town, with commuters travelling to London for things to see and do, but the town does have many leisure facilities – if not much scenery! There are a couple of museums, including the Museum of Reading in the town hall (RG1 1QH). With free entry, it tells the story of Reading from Saxon times through the ages. It features Britain’s Bayeux Tapestry, a Victorian replica of the 11th century original. The Box Room is an interactive gallery featuring a loan collection. Hotels in the city centre are Travelodge Reading Central (RG1 7LT 2.6), Crescent Hotel (RG1 6LL 2.5), The Great Expectations (RG1 4PS 2.8) and Premier Inn Reading Central (RG1 2HN 2.9). There is also the Ibis Reading Centre (RG1 1DP), which is 3.5 miles from the stadium. During December and January, The Hexagon Theatre (RG1 7UA) has ‘Aladdin’ (no performance on 1st January); tickets start at £13.50. The River and Rowing Museum (RG9 1BF) is in Henley-on-Thames. Entry is £12.50, child tickets are £9.95 with free entry for under 4’s, concession entry is £11.50. Historic Windsor Castle (SL4 1NJ) is not far away. From Wednesday to Saturday, The Hexagon Theatre (RG1 7UA) has ‘Singing in the Rain’; tickets are £18. There are mobile bar units outside the East Stand and bars at the back of the stands, where Heineken, Amstel, Guinness Theakstones and Symonds cider are sold. The town centre has 10-15 pubs on Friar Street which is 3.5 miles to the stadium. All are pretty friendly, but wearing club colours may mean entrance is denied. Next to the ground on the Retail Park are McDonalds, KFC & Pizza Hut. There is a Holiday Inn (RG2 0SL) with street parking a 15 minute, one mile walk away. There’s a small bar inside it, but attached is a big Irish bar, called Callaghans. It has Sky TV but gets hugely crowded and drinks are mega prices. Across the road from the hotel is a fish & chip shop. Maybe head down Basingstoke Road and walk up over a hill, there’s a pub called The World Turned Upside Down (RG2 0JE). Away fans are welcome and it serves general pub food and pizzas. From here, it’s a 1.1 mile 15 minute walk to the stadium. If you arrive early, try the village of Three Mile Cross, 1.5 miles from the stadium, it has a few good pubs including ‘The Swan’ (RG7 1AT). The official car park is a nightmare to get out and don’t park in the nearby business park unless you park in a unit paying for parking, as you risk being clamped. If you want street parking, don’t bear left onto the relief road as you leave J11 of the M4, continue straight on and you’ll pass a few roads on your right, park in one of these and walk to the ground (10-12 minutes) and you should get away easily after the game. 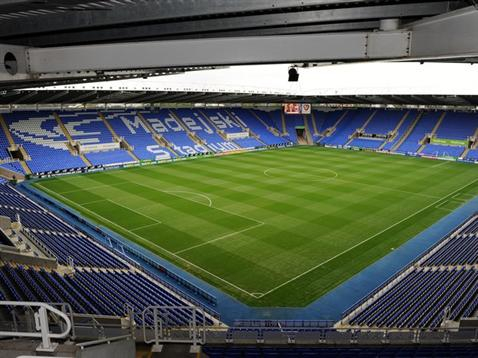 You can also choose from a selection of private car parking spaces near the Madejski Stadium – including a few reservable parking spaces from just £4.00 for the day. There is a Park and Ride facility at Mereoak (RG7 1PB) near J11, with buses going to the town centre via the stadium. Parking is free but return bus tickets are £3.50, Under 19’s £1.70, or a group ticket at £7 (up to 4 people). The station is 3.5 miles away; there’s an F1 ‘Football Special’, from the railway station on Station Hill (turn right out of the main entrance and down the steps). Return fare is £4 and £2.50 for children and takes 15 minutes to the ground; no change is given on the bus. After the game you have to go down to the main road and follow it all the way back to the pick-up point (a 15 minute walk). Trains leave Swansea at 07:17, 08:17, 09:17 and 10:17 for the 3.5 hour trip (part journey by bus). Trains back are at 17:28, 18:28, 20:28 and 21:28 getting into Swansea at 20:47, 21:47, 23:42 and 00:42. For the Travelling Jacks making the trip – Be Loud, Be Proud and Be Positive!